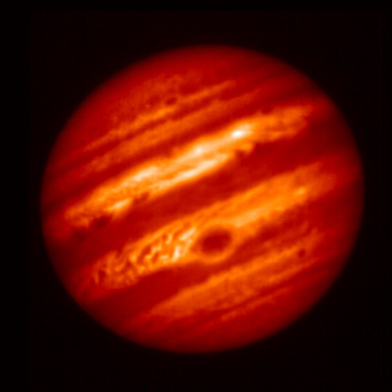 June 30, 2017 – Telescopes in Hawaii have obtained new images of Jupiter and its Great Red Spot, which will assist the first-ever close-up study of the Great Red Spot, planned for July 10. On that date, NASA’s Juno spacecraft will fly directly over the giant planet’s most famous feature at an altitude of only about 5,600 miles (9,000 kilometers). Throughout the Juno mission, numerous observations of Jupiter by Earth-based telescopes have been acquired to help Juno investigate the giant planet’s atmosphere. On May 18, 2017, the Gemini North telescope and the Subaru Telescope, both on Hawaii’s Mauna Kea peak, simultaneously examined Jupiter in very high resolution at different wavelengths. These latest observations supplement others earlier this year in providing information about atmospheric dynamics at different depths at the Great Red Spot and other regions of Jupiter. The Great Red Spot is a swirling storm, centuries old and wider than the diameter of Earth. Juno will use multiple instruments to study this feature when it flies over it about 12 minutes after the spacecraft makes the closest approach to Jupiter of its current orbit at 7:55 p.m. on July 10, MDT (9:55 p.m. on July 10, EDT; 1:55 a.m. on July 11, Universal Time). The observers used Gemini North on May 18 to examine Jupiter through special near-infrared filters. The Gemini observations focus on specific colors of light that can penetrate the upper atmosphere and clouds of Jupiter. 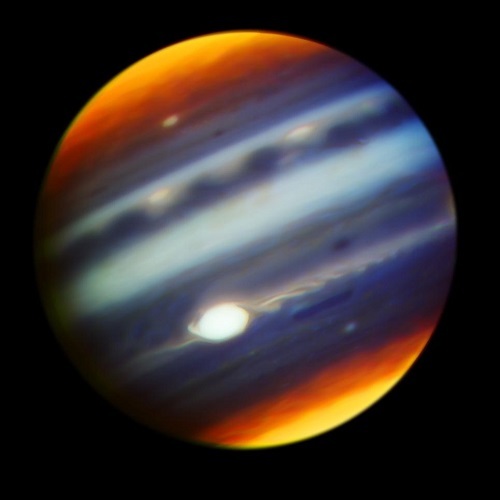 These images are sensitive to increasing absorption by mixtures of methane and hydrogen gas in Jupiter’s atmosphere. Subaru’s mid-infrared imaging and spectroscopy with COMICS are particularly useful to Juno’s, by providing information about the temperature field and the distribution of ammonia, a condensate in Jupiter similar to water in the Earth’s atmosphere. In the full campaign of Earth-based support, the Subaru observations provide the highest spatial resolution of Jupiter’s thermal output due to the 8-meter size of its primary mirror. The Juno spacecraft launched on a United Launch Alliance Atlas V rocket on August 5, 2011 and began orbiting Jupiter on July 4, 2016. The spacecraft has now made five close-up passes of Jupiter’s atmosphere, the first of which was on August 27, 2016, and the latest (the sixth pass) on May 19th of this year. Each of these close passes has provided Juno’s science team with surprises. A primary goal of the mission is to improve our understanding of Jupiter – from its atmospheric properties, to our understanding of how Jupiter and other planets in the outer Solar System formed. NASA’s Jet Propulsion Laboratory, Pasadena, California, manages the Juno mission for the principal investigator, Scott Bolton, of Southwest Research Institute in San Antonio. The Juno mission is part of the New Frontiers Program managed by NASA’s Marshall Space Flight Center in Huntsville, Alabama, for the Science Mission Directorate. Lockheed Martin Space Systems of Littleton, Colorado, built the spacecraft.